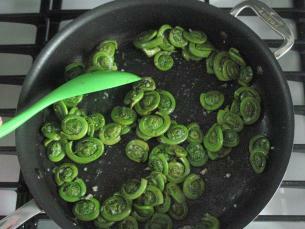 You may have seen these in the produce section of the grocery store and thought “NO WAY”! Well guess what? They’re delicious! 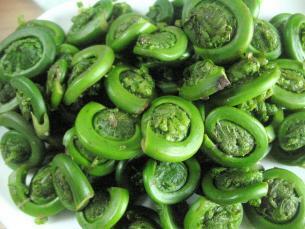 These fiddlehead ferns are also very nutritious. What ever you do, don’t just pop one in your mouth raw. They need to get cooked first! 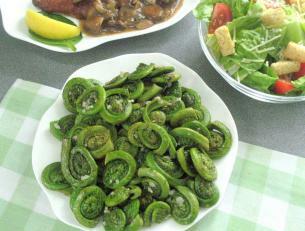 Once cooked, you can then eat them hot or cold, alone, or in soups, salads, or stews. 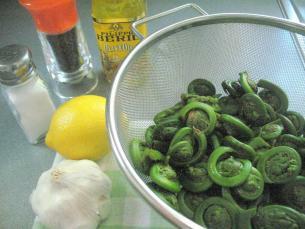 Fiddleheads are only available in the springtime and have a very short season. So grab them when you see them and startcooking! 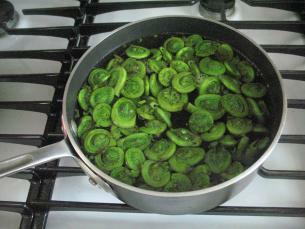 Fill a bowl with cold water and submerge the fiddleheads. 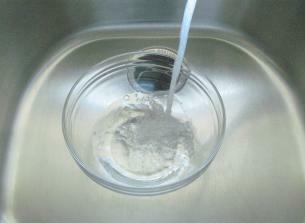 (I stuck them in a colander first and then put the whole colander in the bowl of water.) 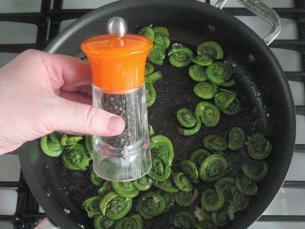 With your hand, swish the fiddleheads to remove any bits of dirt. 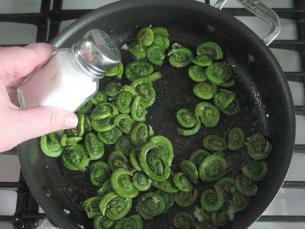 Lift the fiddleheads out of the sink and let them drain. With a paring knife trim off the end. DO NOT SKIP THIS STEP. 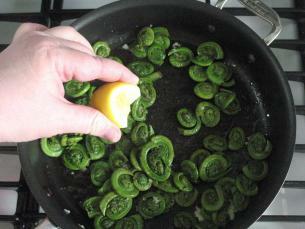 Even though I am going to sauté (fry) the fiddleheads in garlic and olive oil they still need to get boiled first. 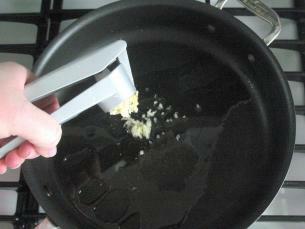 This not only cooks them but it also removes any bitterness. 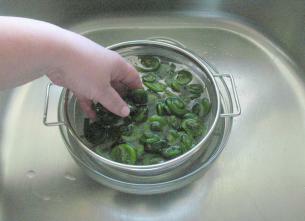 Put the fiddleheads in a pot and cover them completely with cold water. As they come to a boil they will float to the surface. 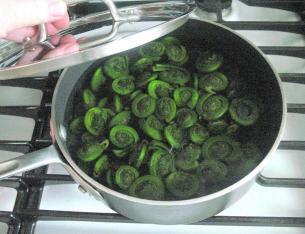 Boil them for 6-8 minutes. The water ends up looking quite dirty! 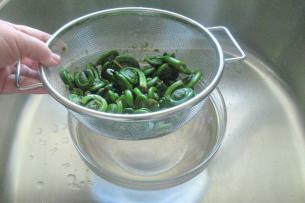 Drain the fiddleheads in a colander. Sauté for approximately 1 minute. 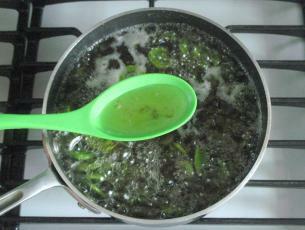 …and a squeeze of lemon juice. 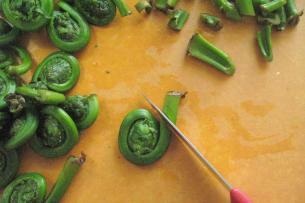 …and the fiddleheads are ready! 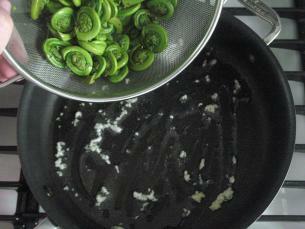 The blanching process removes any bitterness there might be. Some fiddles are more bitter than others, but this makes them all taste wonderful. I like your style! Thanks for all the great tips!